Mestlven follows Meredith as she returns to her home at Sorrow Watch to destroy her enemies. What themes did you use as you built this new story in the Perilisc series? As a man without a father attempting to raise two sons, in a lot of my work, I study fatherhood. In this book, I studied motherhood, and the effects of a mother’s estrangement from her children. I wanted to study obsession and how it can dominate the mind and creep into the soul. So far in the work I’ve published, I’ve played very little with love, and the love that I did show in Chaste was an old and familiar love. In this book I wanted something new and fresh. Of course, I wanted to spend some time on revenge. It is an idea that’s gone through my mind often in my life because of my childhood, and I wanted to develop that theme and play with it in my work. In most or all of these topics, I found a certain amount of cathartic release. Mestlven really did help heal me in a lot of ways, and I’m very thankful for it. 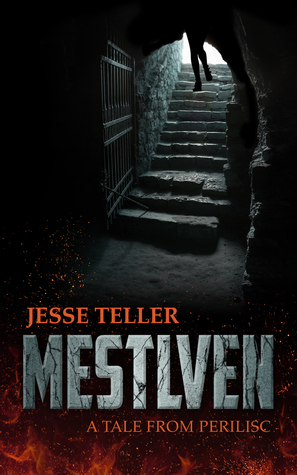 The town of Mestlven is a haven for the depraved, dirty, greedy and perverted. How did you set about creating this vivid world? In my past, I learned that when you live with darkness, you live in darkness. If you’re violent and ugly, the world you live in can’t help but be the same. Evil breeds more evil. The tragedy of Sob’s situation is that she is so enthralled by the idea of her own revenge that she attracts darkness to her. In many places, she had the opportunity to walk away from this darkness and find some other kind of peace. She had the friendship of Sai Sibbius Summerstone, and the love held out to her by Jeffery. But in both these situations, she turned away from that, seeking darkness. Usually, we find what we go looking for. There were many places in the city of Mestlven where you can find goodness and light. But Sob goes out of her way to avoid those places, to look for deadly pets and vile foes, and so the book is wrought with them. The Pale is very morbid in this story. What was your inspiration for The Pale? Did anything develop organically? For the most part, all of my work develops organically. My writing style is very much like I go around setting ideas into motion and watching them spin out of control. Very rarely do I plot an idea’s course. I started out with the idea of a festival of death, and tried to picture the city that would willingly hold such a festival. I realized that none would. None would truly welcome in the goddess of death to take over their city. So she would force her will upon them. I started looking at the sort of things that would be held sacred by the goddess of death, thinking of what would be The Pale’s virtues, what would she love? That’s when I realized she would see killers and murderers as her most beloved. She would hold sacred certain diseases, and when she sees someone like Sob, preparing to paint a masterpiece of death, she would send aid. I pictured the face of death, and what that face would look like, and for some reason, the image was of a beautiful woman with pale skin. So I named her The Pale. My gods I cast as people. They’ve all got their own likes and dislikes, loves and desires. They have their own flaws and their own sins. The only trick to creating my religion is understanding the quirks and foibles of the deity. This being the fourth book in the Perilisc series, are you developing a fifth book or a different story? We’re going to set this story line here for awhile. In 2019, we’ll pick up where we left off and head into a 5-book epic series I have already written that will take us through The Escape. But for now, we’re going to head southwest and find Rayph Ivoryfist for a trilogy called The Manhunters. When we left Rayph Ivoryfist in Liefdom, he had had a falling out with his king, Phomax. In my next book, Song, Rayph has been wandering the countryside of Lorinth, helping out where he can, and waiting for the king to die. Soon, a new evil organization rises, and he must gather what allies he can and rush off to face it. That’s where we go next. It introduces a set of new characters, characters that will show up again everywhere. With the first seven books I release, my goal is to build a character list. I’m introducing as many different people as I can organically in order to have them in place for later novels. What’s exciting about Song, and really the entire Manhunters series, is that we get to meet a new cast of characters, all unique and varied, all of which are leading somewhere. And we get to make cheese. Meredith Mestlven was abused and betrayed by her nobleman husband. After a desperate fit of retaliation, she fled for her life and lost her sanity. Now nearly 20 years later, she returns to her home at Sorrow Watch to destroy her enemies and reclaim her jewels. How far will she go to satisfy her revenge? Dark, cunning and beautiful, Mestlven will win your heart or devour your mind.